When I was younger, I had an assignment to choose an adult in my life to interview and ask questions about their past, their career, and their goals. My grampa, Bob, was an authority figure I loved and felt safe around. So naturally, I chose him for my life story assignment. "C'mere, kid, step into the office," he beckoned me. I remember him lighting up a cigarette in his mouth, tossing his steel-toed boots aside and dawdling across the living room in his worn socks making his way over to me. He opened up the door to his private office in my grandparent's house, a room that was otherwise off limits to me, and pulled out a chair for me to sit on directly in front of him. Face to face we sat. I remember handing over my piece of paper with the interview questions on it, and I carefully studied the details of his face while I watched him look over the paper. A subtle smile appeared on his face, a sight I was not too familiar with at the time. Up until this point, I saw my grandfather as a private and otherwise reserved man who wasn't too keen to spend time with me. But at this moment, it was apparent to the both of us that we had more in common than we had thought. Most of the interview questions I had prepared for my life story assignment were based on his tower construction company. Hearing that he could be his own boss, make his own hours, and choose who he wanted to work with and what projects he wanted to take on was all new to me. It inspired me. The idea of creating a path for my own future motivated me to continue to ask him entreprenurial questions as the years went on, and one of the last conversations I remember having with him before he passed away was about our blog and how I wanted to make it my full-time job some day. His encouragement and support of my goals and what I wanted to make of my life always remind me of the first time I had an adult conversation with my grandfather--when I interviewed him about his life story, and I asked him to share his entrepreneurial ways with me. Father's day is only a couple of weeks away, and someone recently asked me who I was going to celebrate it with. Every year, since his passing, I wish I could call my grampa and catch up with him. No matter how much older I got, he would always call me "kid." His passing, in a way, was also the formal ending of my childhood. But whenever I think back to my fond memories of him, especially around Father's Day, I am reminded of the quietly fervent and loving support he had always shown me. Today, while I smile and remenisce about the times I had chatting with him, I cannot help but laugh and rememeber all of the stories from his past he would tell me and share with me over a beer in his office or at his kitchen table. This Father's Day, I plan on having a Michelob ULTRA and some almond flour fried chicken while I think back to Bob's stories and honor the man who inspired me to be an entrepreneur. 1. 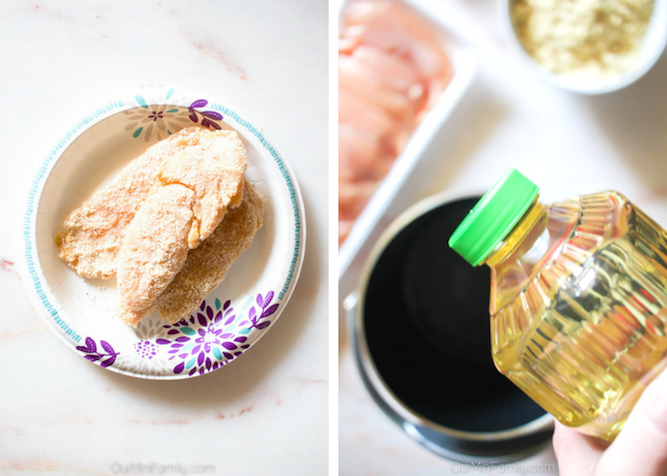 Warm the avocado oil in a small, countertop deep fryer. Allow it to heat up for 15 minutes (or the suggested time that your personal deep fryer recommends). 2. Crack the eggs into a small bowl, and whisk the eggs until they are frothy. 3. Prepare a larger bowl or deep platter with the almond flour, paprika, black pepper, and garlic salt. Mix the dry ingredients together. 4. 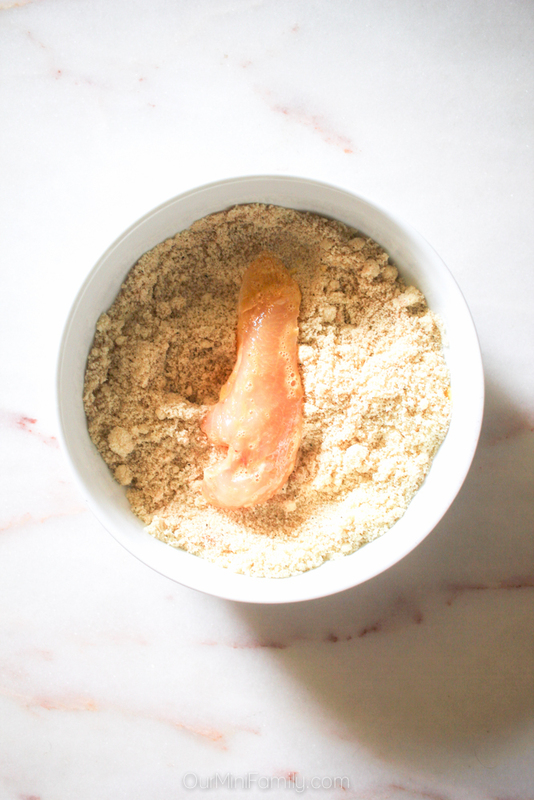 Dredge the chicken in the egg and almond flour mixture. Do not put the chicken back into the egg after you have covered it in flour. Continue to turn the chicken and press the flour mixture into the chicken tender until it's fully covered. Shake any excess flour off. 5. 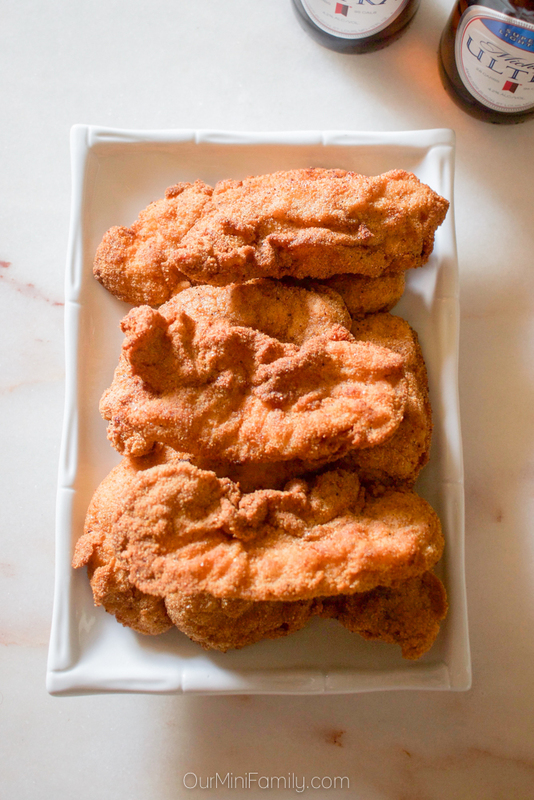 Once the deep fryer is heated up, fry each piece of chicken tender one at a time. Once it is fried to your likeness, set it aside. 6. Preheat the oven to 350 degrees (F). 7. 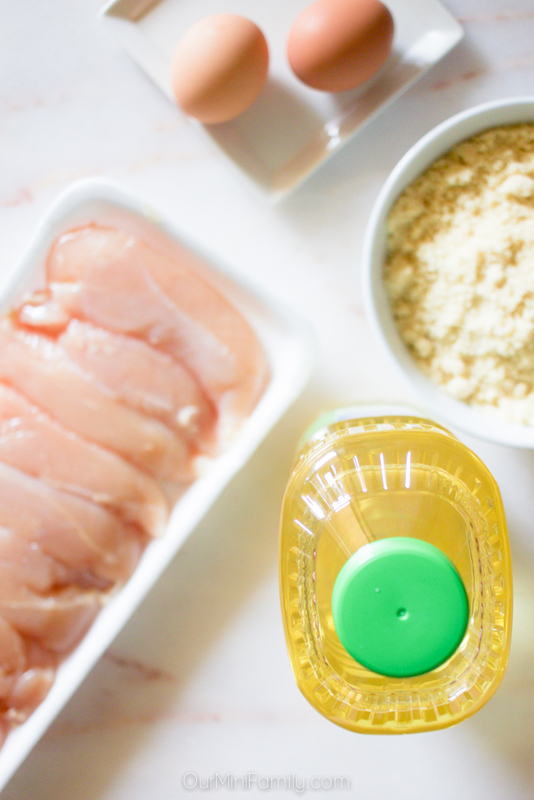 Continue to dredge the chicken in egg and almond flour until you are done. Place the chicken on a baking sheet and cook the chicken in the oven at 350 degrees (F) for 12-15 minutes (to ensure they are cooked all of the ways through). 8. Serve warm and with an ice cold Michelob ULTRA! Enjoy! 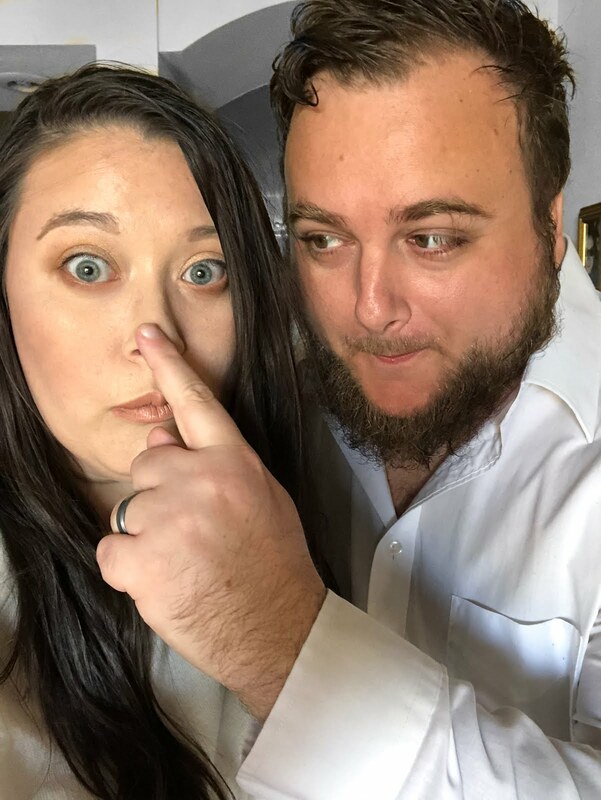 Since Adam and I started to adapt to a ketogenic diet, we have been experimenting with ways to cut down on our consumption of carbohydrates while still enjoying some of our favorite foods. Using almond flour is our preferred way to cut down on carbs when it comes to breading and baking food. 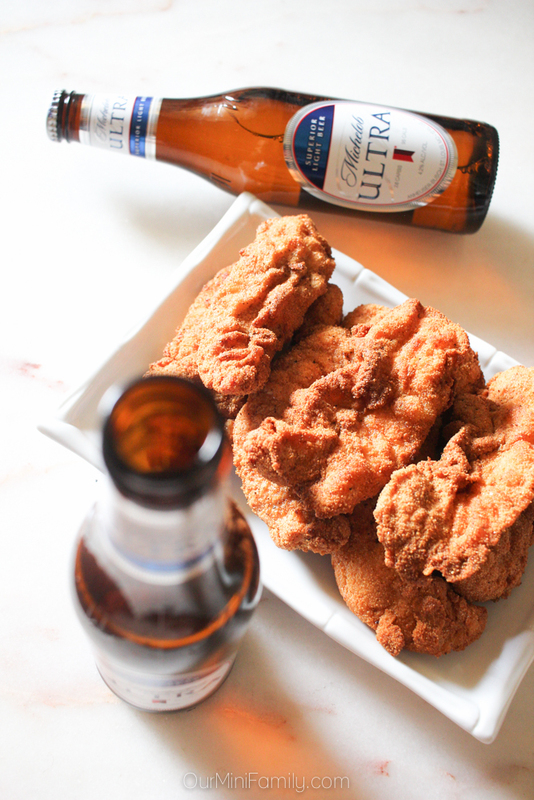 Fried chicken and beer are definitely some of our favorite things, and since Michelob ULTRA is only 2.6 grams of carbs per bottle I don't feel guilty having a bottle of beer with this keto-friendly, almond flour fried chicken! 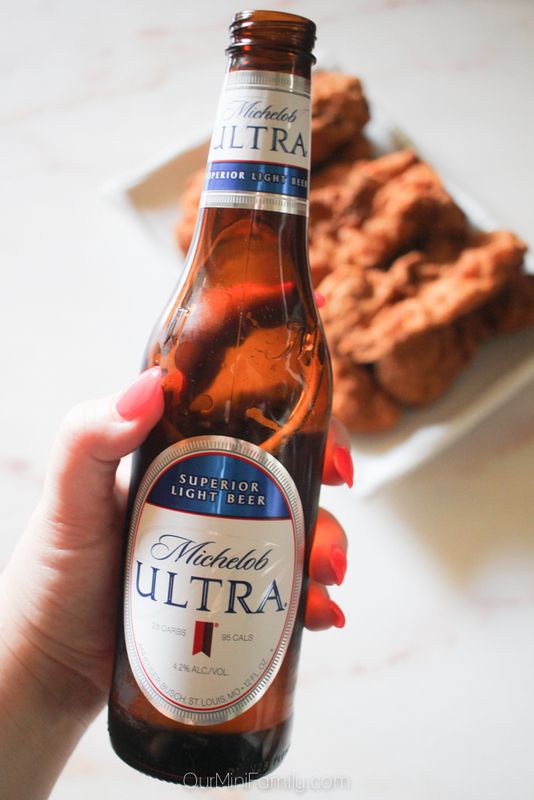 No matter who you are celebrating on Father's Day, you can pick up a case of Michelob ULTRA bottles at your local store as well as all of the ingredients you'll need to try this ketogenic diet recipe! Celebrate the ULTRA father figure in your life with one of these! Aw, both of my grandpas died before I was born and I did not get to met either one, but I miss my maternal grandmother very much! This recipe looks easy to make and delish! And a cold brew is a great pairing too! I am i love with these photos! What camera do you use? They are so fresh and clean and really pop! I haven’t tried almond flour before. Hmmm... now I’m curious. Will definitely give this a try one day. I haven't heard of almond flour before... it seems quiet tempting... i think i am surely going to try once... something i am looking forward to tr soon. these look so good! 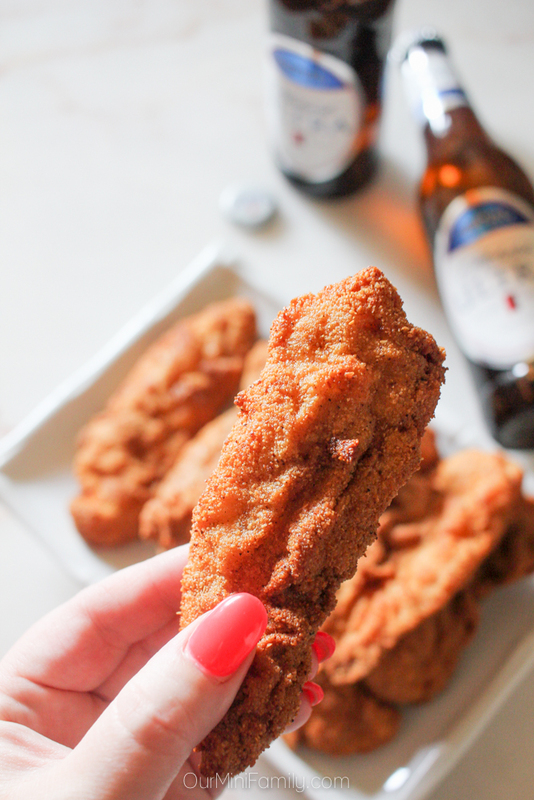 Ive never fried chicken before, but this recipe makes me want to try! I'm currently back on keto and love almond flour! I'll be trying this recipe out soon - it sounds delish! 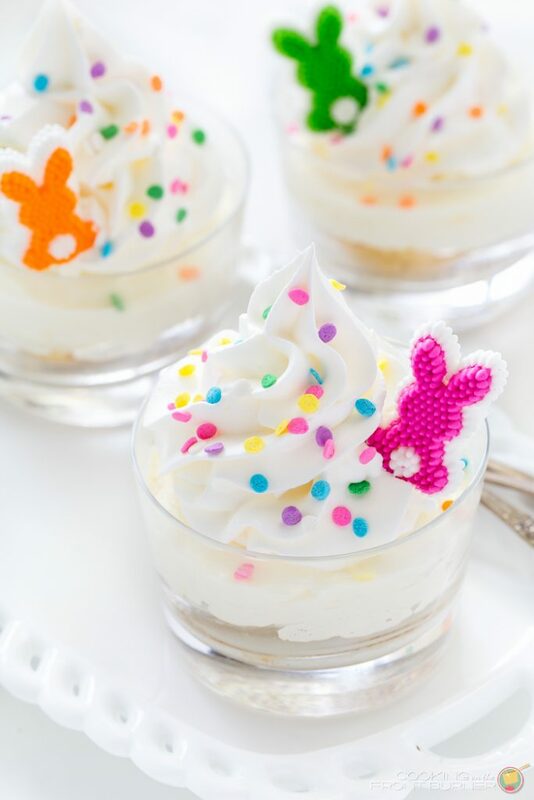 These look delicious and perfect for the whole family! I haven't tried almond flower before but I am curious to try it now, thanks for sharing! Sounds yummy. It's been a while since I've used Almond flower but sound much better than white that ends up making us not so attractive! And a nice cold beer, yeah! My family really loves fried chicken but can't eat it a lot. I bet using almond flour will make it a crispy crust. This chicken looks amazing! So crispy and crunchy without all the flour. Delicious! 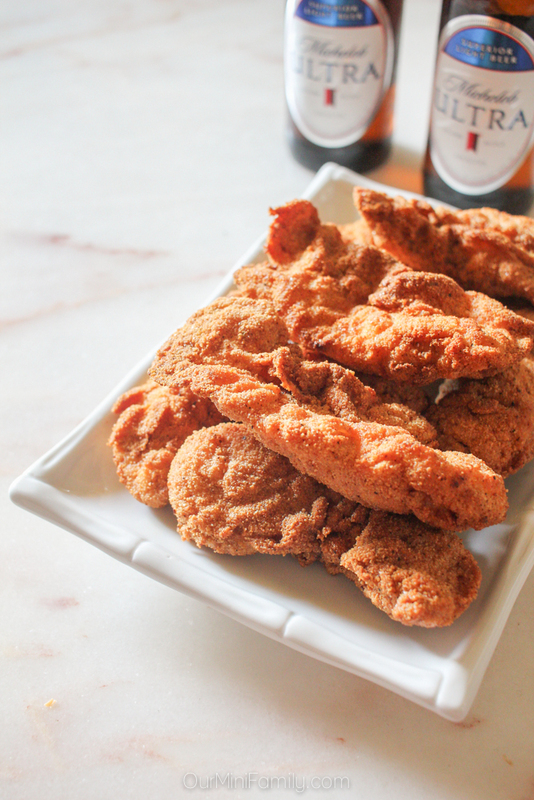 Oh wow never thought of using almond flour as a coating but looks really yummy! Im going to need to try that with my fried chicken. Great recipe! I love this story so much and your memories of Bob, what a great inspiration for your business and life! What a great memory with your grandfather! I love it! And this dish looks so amazing! I look forward to giving it a try! 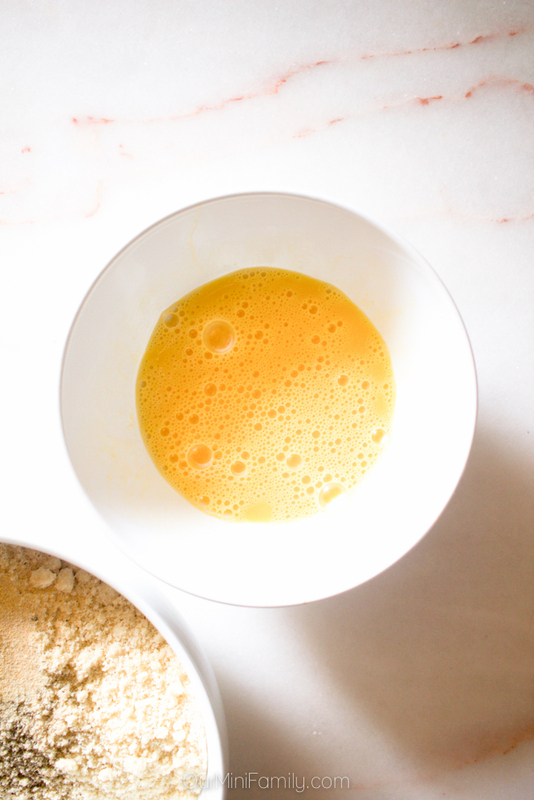 Almond flour is so much fun to cook with. This recipe is a must have!